"When people are forced to leave their homes, they usually also leave behind their means of economic activity. In their new location, they may not be able, or permitted, to work. This has wide-ranging implications. 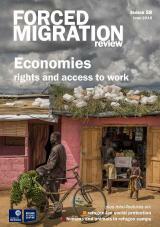 This issue includes 22 articles on the main feature theme of Economies: rights and access to work. It also includes two ‘mini-features’, one on Refugee-led social protection and one on Humans and animals in refugee camps."